On NW 74 Street ALL westbound lanes will be closed between NW 72 Avenue and NW 74 Avenue. On SR 826/Palmetto Expressway three northbound inside lanes will be closed at NW 58 Street. On SR 826/Palmetto Expressway three southbound inside lanes will be closed at NW 58 Street. On SR 826/Palmetto Expressway four southbound outside lanes will be closed between NW 58 Street and NW 36 Street. On NW 25 Street the entrance ramp to SR 826/Palmetto Expressway northbound will be closed. On NW 36 Street westbound the entrance ramp to SR 826/Palmetto Expressway northbound will be closed. On NW 36 Street eastbound the entrance ramp to SR 826/Palmetto Expressway southbound will be closed. On NW 36 Street eastbound the entrance ramp to SR 826 Palmetto Expressway northbound will be closed. 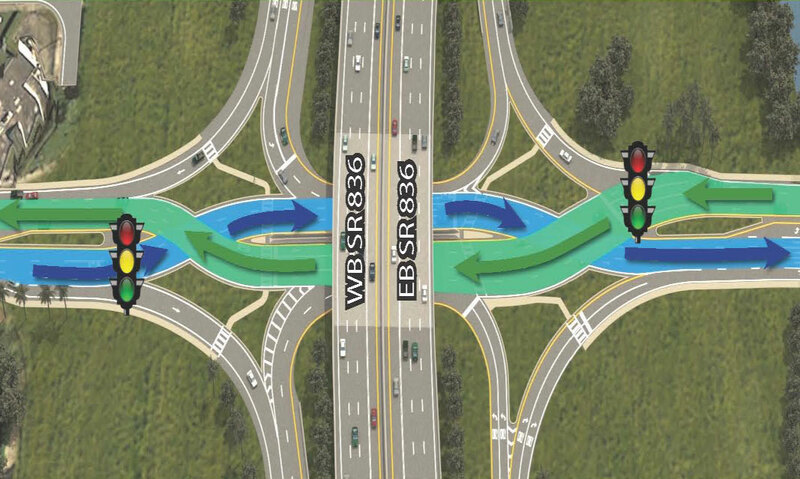 Drivers will cross over to the LEFT or opposite side of the road under SR 836 at NW 27th Avenue.